Established in 1992, Orchard Hotel Singapore’s signature restaurant Hua Ting has built a firm reputation as one of the top Cantonese fine dining restaurants in Singapore. Many spirits were shaken at the news of its closure some months ago but finally, after an extensive four-month facelift, Hua Ting Restaurant returns with a sophisticated new look and an improved menu to match. 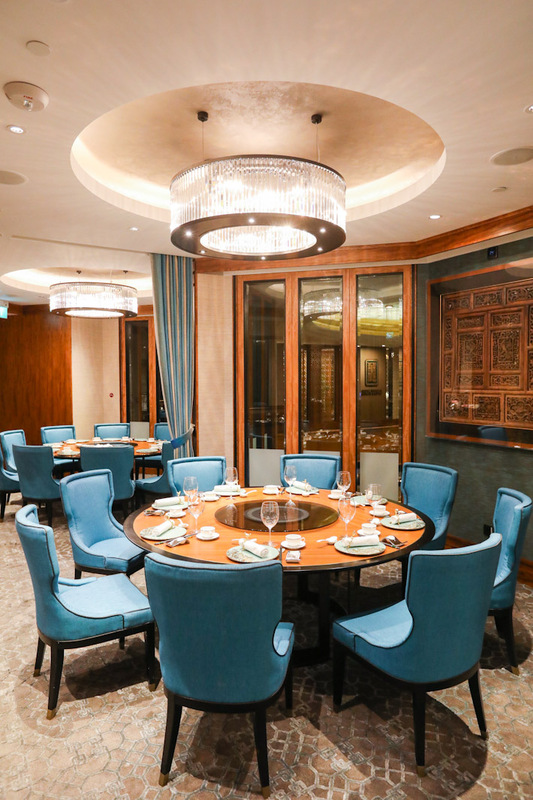 At the helm of this grande dame is Masterchef Chung Lap Fai, and along with his team of veteran Chinese chefs, a brand new menu is introduced—one that aims to impart traditional flavours in a contemporary fashion. Look forward to a myriad of intriguing new dishes and creative tea-and-food pairing menus alongside the restaurant’s signatures and crowd-pleasers, all plated and presented in a sleek, artistic fashion. New to Hua Ting Restaurant’s menu is their Smoked Peking Duck infused with Aged Pu-Erh served with Yuzu Sauce. Aromatic, succulent and everything you could ever want in a Peking duck dish (and more), it is one of those dishes that you’ll find yourself hankering over for days. 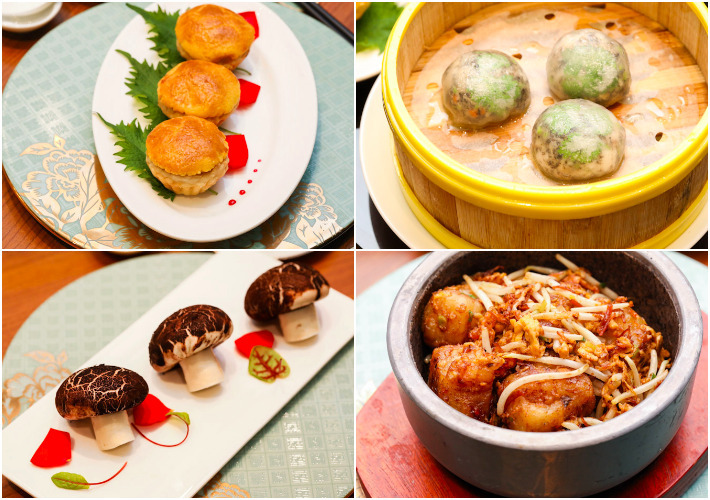 We are definitely loving Hua Ting Restaurant even more than we already did! To match the restaurant’s modern furnishing and finer decorative outfits, the menu has been totally revamped but rest assured that the old favourites are still very much in place. 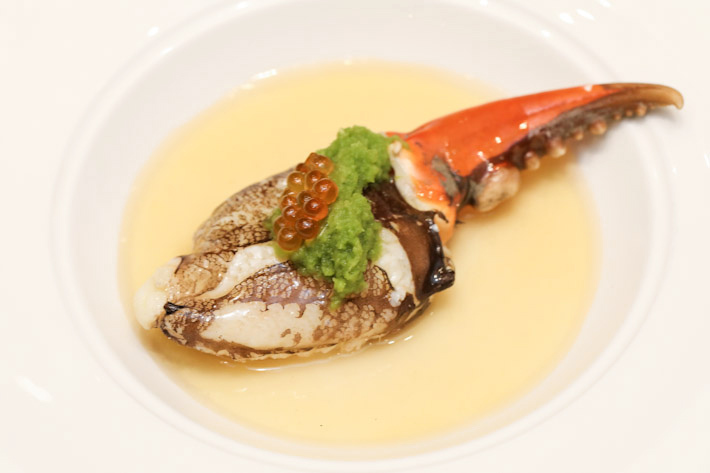 Having spent the restaurant’s downtime revising the menu, Masterchef Lap Fai might have elevated the look and presentation of his dishes, but at its heart, the menu still stays true to its traditional Cantonese roots. Nothing defines ’comfort’ like rice in hot soup and Hua Ting Restaurant’s version will blow your mind with its wild-caught Dong Xing Garoupa and Crispy Rice in Superior Stock. Inspired by Korean bibimbap, the dish is first presented in a piping-hot stone bowl displaying only rice with a layer of raw fish slices, to which the server pours over the hot stock that instantly cooks the fish. 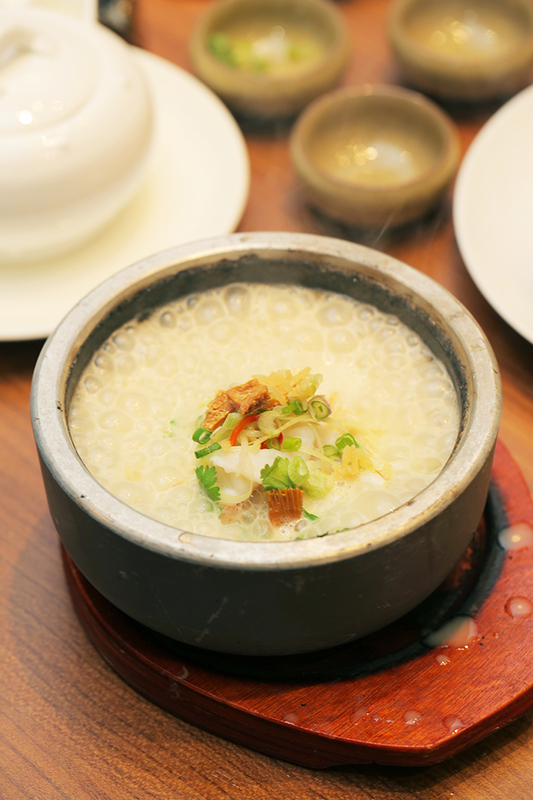 At the side, you can help yourself to freshly diced scallions, fried fish bones as well as crispy puffed rice to give the indulgent rice porridge an extra punch of flavour. Hands down, this was easily our favourite dish of all. The dish was comforting with a mixture of sweet, delicate flavours and the different textures present in the dish itself made it all the more delightful to eat. 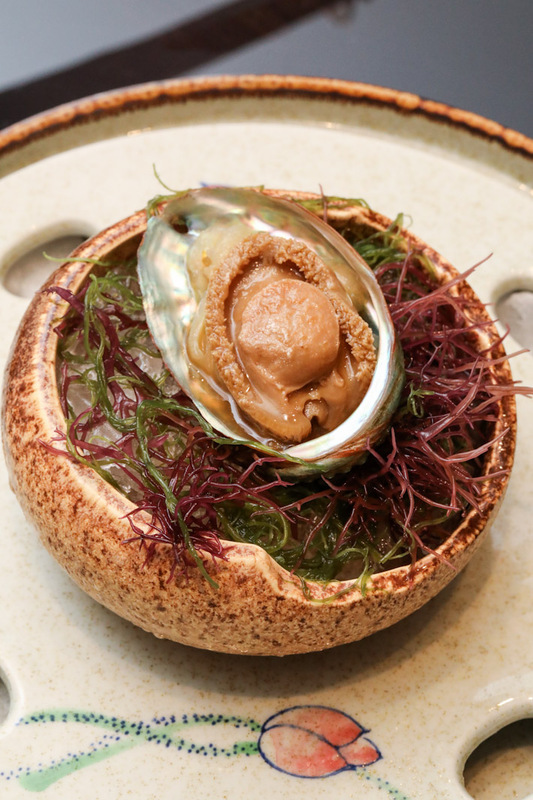 True luxury knows no equal as far as the Chilled Marinated 16-head South African Abalone is concerned. A true delight to look at (let alone eat), this ocean gem is marinated with sake over a long period to give it a more intense flavour boost. Served cold, we really enjoyed the harmony of textures and sensations that were present in our mouth upon each bite. 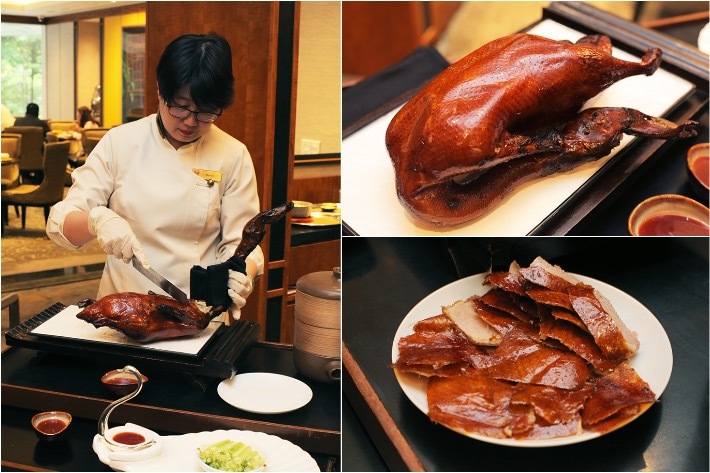 New to Hua Ting Restaurant’s menu is the ambrosial Smoked Peking Duck infused with Aged Pu-Erh served with Yuzu Sauce. What else can we say? We are suckers when it comes to Peking duck—from its irresistibly crispy skin and succulent flesh right down to the decadent hoisin sauce that just ties in all the flavours. This aromatic rendition is taken a notch higher than your average Peking duck with the strong infusion of fragrant pu-erh tea leaves that, aside from perfuming the meat as it cooks, add another layer of flavour that might intrigue the palate at first, but no doubt tastes brilliant. 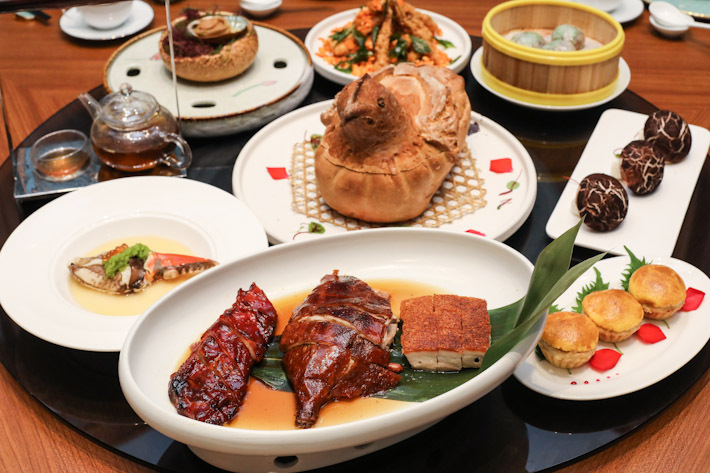 Boasting a similar profile to the Smoked Peking Duck, Hua Ting Restaurant’s Signature Roast Trio Platter—that features crispy roasted duck, crispy roasted pork and charcoal-grilled Spanish Iberico pork char siew—is true indulgence at its finest. 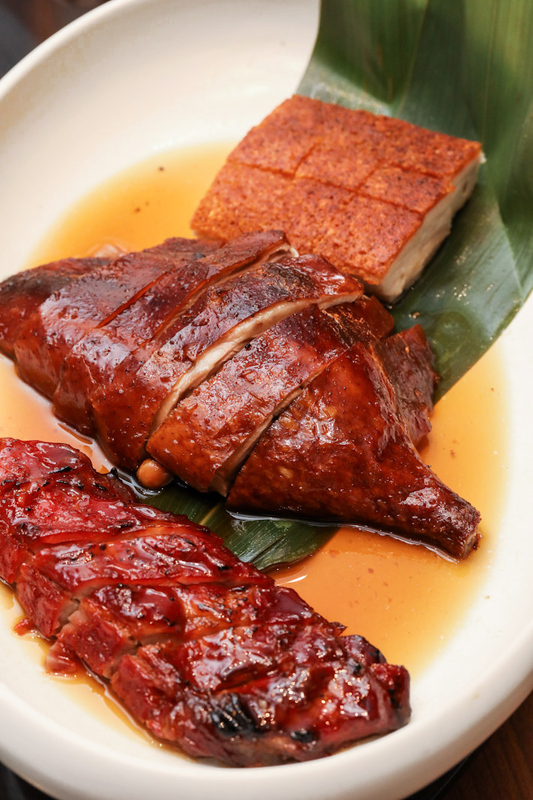 Neither gamy nor tough, every bite of the roasted duck promises an aromatic punch that is further accented by the decadent fat that oozes out from the meat. And as far as roasted pork dishes go, we dare admit that very few can beat their stellar char siew and roasted pork. With a distinguished career that spanned more than three decades, Master Chef Lap Fai is more than just a chef; he is an artist in his own right. And the restaurant’s Baked Empress Chicken Drumstick, Abalone, Fungus and Chinese Herbs is a testament to that. This dish is as much as a culinary masterpiece as it is a melting pot of unbelievable flavours. 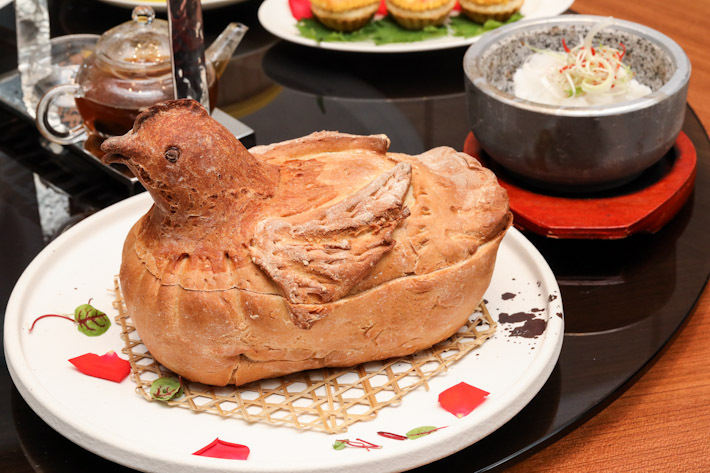 Encased in a hen-shaped bread bowl, of which Chef Lap Fai moulds himself daily, hides a fork-tender chicken drumstick as well as mushrooms and other edible goodies—all stewed down to tender perfection. A signature on their dim sum menu and a true representative of the restaurant is Hua Ting Restaurant’s Signature Baked Mango Chicken Tartlet. Encased in a crispy, buttery bo lo bun hides bits of sweet, minced chicken and diced up ripe mangoes. While many might flinch at the thought of this unlikely pairing, we promise you that it is good. Another item to look forward to is the Wok-fried Turnip Cake with House-made X.O. Sauce in Hot Stone Bowl. Brimming with delicious savoury, slightly spicy qualities and exuding a strong wok-hei flavour, this dish is a great accompaniment to have alongside the sweeter dim sum options. For something that looks presumably simple, we were rather impressed by the complexity of flavours present in the Steamed Fresh Crab Claw, Egg White, Spring Onion and Ginger Purée. Sitting on a bed of firm and silky egg white, the crab claw was meaty and sweet. But what truly made this dish divine was the combination of the assertive, subtly spicy house-made ginger purée and salty ikura. 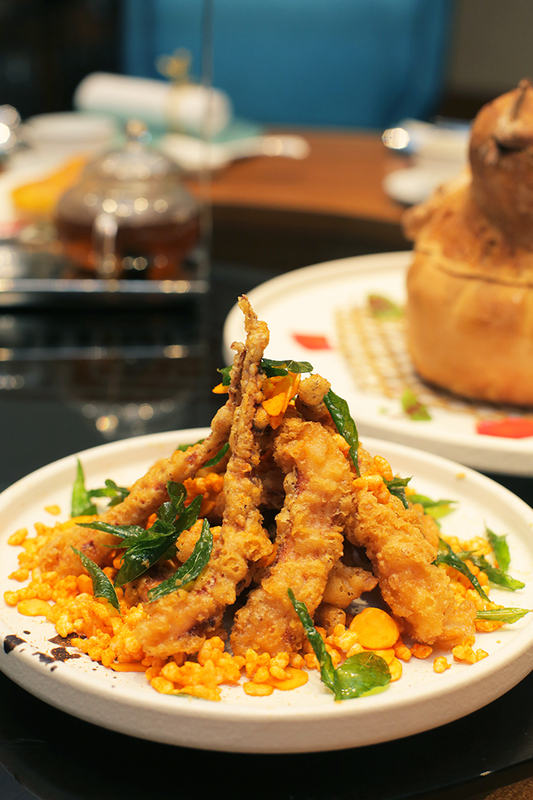 The Crispy Squid Tentacle, Chilli Padi, Almond Flake is something that comes highly recommended. A slight derivative of the iconic salted egg yolk crispy squid that we’re used to, this rendition features flakes of almond that add a nice crunch and nutty note to the dish. Battered and fried till golden and crispy, the battered squid takes on the flavours of its accompaniments pretty well without being overly greasy. A new addition to Hua Ting Restaurant is their specially curated tea-pairing menu that is crafted by Masterchef Lap Fai himself. Like wine, he believes that tea has the ability to provide a new dimension to a meal, either by complementing certain dishes or enhancing them. 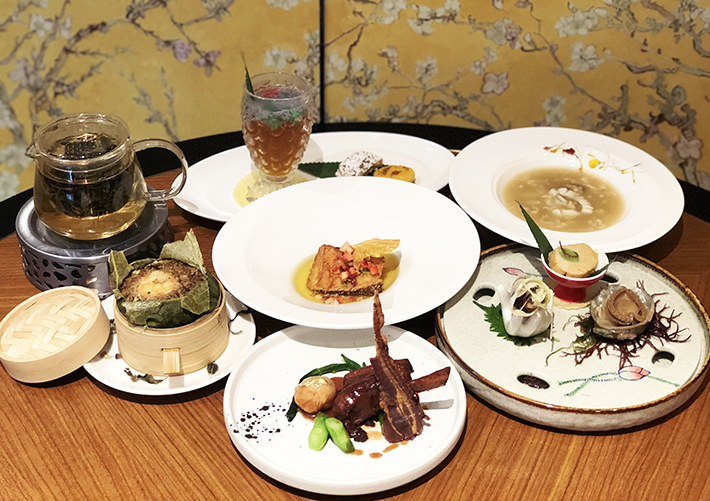 For S$98++ per pax, savour a whole array of fine dishes matched with premium brews, such as Fried Rice with Conpoy and Organic Black Garlic in Lotus Leaf, infused with Jasmine Pearls tea—a pairing which he believes is the most suitable in bringing out the subtleties—and more! The entire experience will heighten your love for tea and it is the best way to truly appreciate fine tea and food. This post was brought to you by Hua Ting Restaurant.